Material: Chiffon&coins. 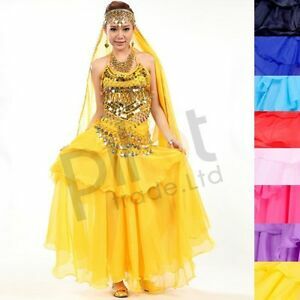 Color: 8 Colors Available(A - BLACK,B-DARK BLUE,C-SKY BLUE,D-HOT RED,E-PINK,F-ROSE RED,G- PURPLE,H-YELLOW). TOP 's size:fits for 32-38 A/B It is only for dance but not for daily use so it can not cover all chest up to B .